Rain will likely be in the game, too. This week’s issue of Dengeki PlayStation has the latest information on Sword Art Online: Hollow Realization, providing insight into the game’s new “Emotion Void” communication system. In Hollow Realization, “emotions” play a key role in both character development and interaction. Specific emotions are displayed within a blue circle on the status screen, and its size will change through character interaction. A heroine’s emotions will also change if you’re on a date with them. Depending on Kirito’s actions, a unique emotion may appear. During battle, these emotions (such as “passionate” or “mindful of allies”) will appear above the characters, and their actions will change based on their emotions. By sending a “Good!” when an emotion is displayed, they’ll take more progressive action. 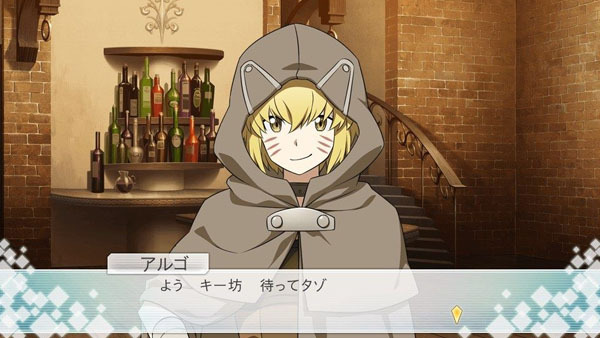 Dengeki PlayStation also reveals that Argo will appear in the game. She’s voiced by Shiori Izawa and can fight alongside Kirito in battle as a party member. Finally, the magazine has a brief Q&A with producer Yosuke Futami. In it, he says that while they have yet to decide in what form, they’ll be sure to have Rain from Sword Art Online: Lost Song appear. Also, PS Vita users can play multiplayer via infrastructure mode, and there is no PlayStation 4 and PS Vita cross-play. Sword Art Online: Hollow Realization is due out for PlayStation 4 and PS Vita on October 27 in Japan, and this fall in North America and Europe.